Dave Fox is a passionate traveler and writer who enjoys sharing his expertise with others. He gives lively interviews and has been featured on radio, television, and in print publications on four continents. 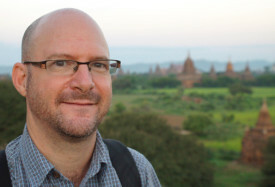 Dave Fox in Bagan, Burma. Originally from the United States, Dave is currently based in Ho Chi Minh City (Saigon), Vietnam, but travels frequently throughout the world. He is happy to do interviews in person, or by phone or Skype. (And yes, he’ll even do them at odd hours if you’re in a time zone that requires it.) He also offers fun and enlightening presentations on topics pertaining to travel and writing, as well as travel storytelling and hilarious humor keynotes he can customize for any group. NEW: Globejotting in the Classroom: Student workshops and teacher trainings on travel journaling and culture shock – for international schools (K-12) and universities. The List: 50+ Countries and Counting! Publicity Photos: Available on request.